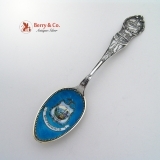 American sterling silver souvenir spoon commemorating Henry Wadsworth Longfellow with an image of his home in enamel in the bowl as well as a handle decorated with an image of his birthplace, his last name, and his face above books and paper. 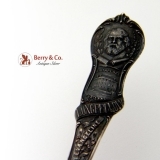 Embossed "VILLAGE BLACKSMITH" "HIAWATHA" "EVANGELINE" "LONGFELLOW" "BIRTHPLACE PORTLAND ME" on the handle in block period script. Inscribed "LONGFELLOW'S HOME PORTLAND, ME." in the bowl in red enamel. Made by Watson Co. c.1900. 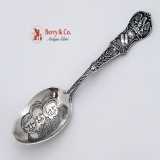 This attractive souvenir spoon measures 5 13/16" long and weighs 1 ozt. The excellent original condition and clear, crisp detail, with no removals, repairs or alterations, make this an especially attractive offering. Inscribed as described above.